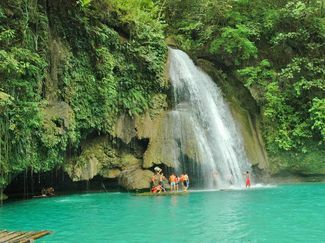 Kawasan Falls is a popular getaway destination in the southern part of Cebu. When you get to Badian Town, you'll have to walk 15 to 30 minutes or less along a very rocky and narrow path. But even though you might stumble a bit, just take it easy and enjoy the trek going up. There's a beautiful river and all different kinds of tropical plants. It's not everyday you'll have a beautiful view like this. You'll have to cross 3 small bridges before reaching the falls. Try to stop at this moment and look upstream. Your camera can't wait to take some shots of the background and give you a forever lasting picture of what paradise is. The first one is the largest and is usually the most crowded. You can bring some food. But If you want to just relax you don't have to bring in food since it's available from the resort's restaurants. Cottages and tables are also available for rent. You should rent a bamboo raft to take you around the lake, or for a refreshing "waterfall massage" under the falling water. You also have the opportunity to climb up beside the waterfall and jump into the water, just like Tarzan! While you and your friends are enjoying the cool and deep freshwater, the surroundings are relaxing and peaceful. Remember that this area is popular with locals as well as tourists!